Sales growth in the pharmaceuticals and healthcare market is supported by a robust economic outlook and increasing private and public healthcare spending. The Indian chemicals industry is forecast to record value added growth of 6.8% in 2018 after increasing 4.9% in 2017. Petrochemicals producers benefit from moderate oil price levels, resulting in better margins. The outlook for the agrochemicals and fertilizer segment is stable, based on the expectation of a “regular” monsoon season and government initiatives. Speciality chemicals remains a fast growing segment, on the back of favourable oil prices and strong domestic and export demand. 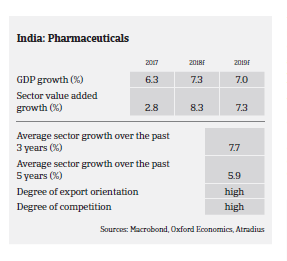 Growth of India’s pharmaceuticals and healthcare market is supported by a robust economic outlook and increasing private and public healthcare spending. However, revenue growth is expected to remain at a single digit level, due to increasing substitution of patented drugs with generic drugs in the US and Europe as well as growing competition in the domestic market. Branded generics account for about 70%-80% of the Indian drug retail market, with low price levels due to intense competition. This competition is about to become even fiercer due to the increasing use of generic drugs and a decline in the approval of new products. While many pharmaceutical businesses continue to engage in acquisitions in order to overcome regulatory and competitive headwinds, increased R&D expenditure, price capping of about 375 drugs by the National Pharmaceutical Pricing Authority, and price pressure in the US and European markets resulted in decreasing profit margins in 2017 and early 2018, and this trend is set to continue over the coming months. 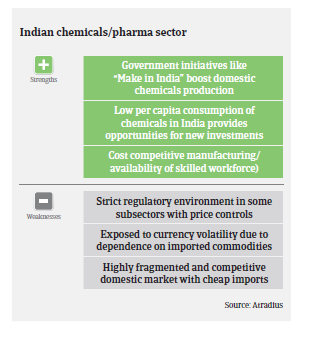 On average, payments in the Indian chemicals/pharmaceuticals sector vary between 60 days and 180 days, depending on the position in the value chain and businesses bargaining power, credit policy and geographical position. E.g. pharmaceutical companies supplying generic drugs have to offer extended credit terms due to high competition in this segment, while chemicals manufacturers purchasing raw materials have shorter credit terms. The level of payment delays and insolvencies is rather low in the chemicals and pharmaceuticals sectors, and no major increase in business failures is expected in 2018. Despite decreasing profit margins, the financial position of most pharmaceutical businesses remains satisfactory, with healthy capital structures and robust debt protection measures. Lending conditions are still benign, and many companies have been successful in raising funds from banks for capital expenditure and buyouts. Due to the general financial strength, our underwriting approach to the Indian pharmaceuticals sector is generally open, despite price capping measures having an adverse effect on profit margins. Businesses with strong brands in the OTC (over the counter) segment are well suited to overcome market difficulties. 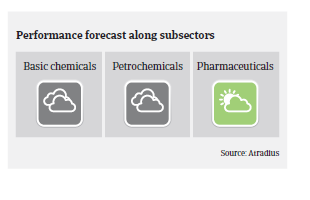 That said, our underwriting approach to the chemicals sector is generally just neutral for all main subsectors (basic chemicals, petrochemicals, agrochemicals and fertilizers), despite the growth outlook. In the petrochemicals segment manufacturers and traders with large raw materials inventories could be adversely affected by sudden oil price changes. Stiff competition and price pressures in a very strictly regulated market environment impact the basic chemicals subsector. The performance of the agrochemical and fertilizers segment remains highly dependent on the outcome of the monsoon season and the amount of government subsidies, while businesses in this segment are characterised by large inventories and high working capital requirements. 2018 brought many changes in India – more frequent payment delays, increases in the proportion of overdue B2B invoices and DSO, a longer payment duration. Despite robust growth rates, pricing pressure and cheap imports are key challenges in the domestic ICT market, especially for smaller IT distributors. A country of infinite diversity, India is a promising market for foreign exporters. The principles highlighted in this report are designed for those venturing into this vibrant business environment.